Talk about staying cool in the heat while going to the swimming pool or beach, taking a bath, washing the car, or drinking cold water. Read One Fish, Two Fish, Red Fish, Blue Fish, Finding Nemo or The Rainbow Fish. Talk about the animals and fish that live in the water. 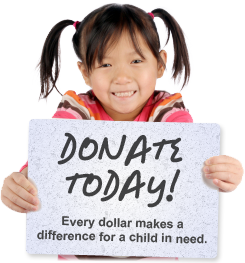 Give dolls or favorite animals a bubble bath, and talk about washing them and taking them in and out of the bath, and making them wet and dry. Drive toy cars and trucks through a “car wash,” by spaying them with spray bottles, washing them with sponges, and talking about making them wet and dry. Label the things you see while at the beach (e.g., crabs, shells, fish, water, sand, waves) and talk about whether the water is hot or cold. Small plastic fish, ducks or other animals. Paint brushes for “painting” the sidewalk. 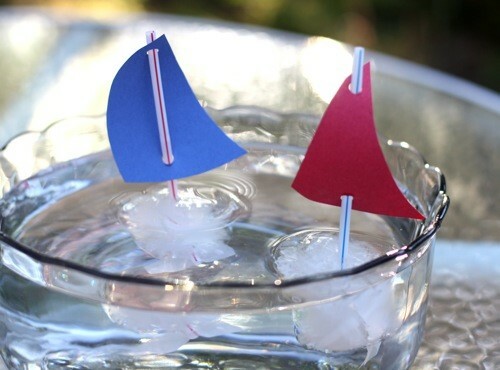 Boats or make your own Ice Cube Boats. 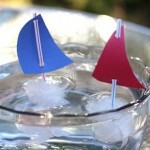 Make ice in a plastic cup set with drinking straw and a flag for a sail. Perfect for hot days. Plastic cups, funnels, and strainers for pouring and filling. A watering can for watering plants.